Master of the Teutonic Order from 1256 to 1273. Anno has no relation to the Princes of Brunschweig, as wrote it an historian, and none with the free and playful chivalry of the German Empire. As Bart, Salza and Wüllersleben, he came from a family of bailiffs from Landgrave in Thuringia, of which the city of Sangerhausen was probably the principal domain. We know only few things about his family, even if Jutta von Sangerhausen(1), venerated as the angel of Chełmża were his parent. Anno suddenly appears in the history of the Teutonic Order in 1254 as Master of the Province of Livonia(3). The properties of the Teutonic Order lie along the eastern Baltic Sea and spread from Pomerania to Livonia. Lithuanians were at peace with the Teutonic Order, and along the banks of the Niemen River, expanded the new stronghold of Klaipėda. Anno von Sangerhausen contributed significantly to the building of this fortress and when it was attacked by Samogitians(3), he rushed to its rescue, and with a lot of bloodshed he pacified the entire region of Samogitia. In June 1256, Anno had to go to Rome to attend the General Chapter convened by the Grand Master of the Order, Poppo von Osternohe, who resigned under circumstances still unclear to this day. Some time later, probably during the Chapter convened in Frankfurt-am-Main some months later, Anno von Sangerhausen was elected new Grand Master of the Teutonic Order. After a few years of relative peace, Samogitians attacked Livonia with the help of Lithuanian King Mindaugas(4). In September 1260 in Prussia, all the tribes revolted against the Order and Alexander Nevski(5), prince of Novgorod, left the city of Psków to besiege Dorpat(6). All those oppressed by the Teutonics attacked them and the Order narrowly escaped this onslaught. It lost most of its castles and kept only those along the rivers and the cove of the Vistule. To save the Order in mortal danger, Anno von Sangerhausen launched a diplomatic offensive across Europe and especially at the papal court, where he managed to obtain the summons by pope Urbain IV of all Crusaders across Central Europe. The Pope requested their assistance in fighting the pagans of the North, and even offers absolution to all who committed offences in their country if they helped the Teutonic Knights. Thanks to this call, Anno was able to quickly return to Prussia in January 1263 with a sizeable troop of cavalry particularly from the Rhineland. After this first success, Anno starts to recruit everywhere in Europe, but especially in Germany, in his native Thuringia, in Brandenburg, Franconia at the princes of Brunswick, in Altenberg, Marburg, Quedlinburg, Eger, Regensburg. He even goes to Bohemia and Austria, and no doubt thanks to all this energy, new knights arrive non-stop in Prussia. The other result of his efforts was the creation of 16 new preceptories in Europe such as for example in Venice, St-Leonardo, Mottling and Eger, from which the Order drew a lot of money for its military actions in the East. When in 1265, the pope Clement IV asks again for assistance for the Teutonic Order, even Prince Albert II of Brunswick(7), Landgrave Albert II of Thuringia(8) and Margrave Otto III of Brandeburg(9) come to its help. But it is the expedition of Margrave Dytryk II(10) which devastated Natangia(11) and carried the most serious blow against Prussia in 1272. As of that moment, Teutonics began to take back the lands lost previously and, they seized back the fortress of Lidzbark and push back resistance beyond the bordering areas of the Teutonic State. 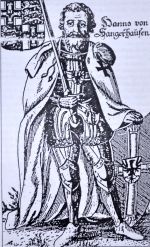 Anno von Sangerhausen died on July 7th or 8th 1273 in Germany without seeing the definite triumph of the Order. One doesn't know neither the exact place of his death nor of his burial. Chroniclers say that it would be in Trier or in Mergentheim. 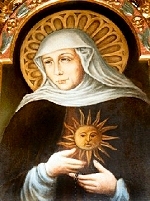 (1)Saint Judith (Jutta in German), also called Judith of Kulmsee (Chełmża), Judith of Sangerhausen or Judith of Thuringen. She was born in the beginning of the 13th century. At the death of her husband, she entered the Secular Franciscan Order and joined a community at the border of the Teutonic territories (Kulmsee - Chełmża) in Pomerania. She is honoured as Patron Saint of Prussia. (2)Province of the Teutonic Order located east of the Baltic Sea. Its territory comprises almost entirety of the territory of the current Baltic States: Estonia, Latvia & Lithuania. (3)Samogitians were among Baltic Tribes occupying territories of current Lithuania, Estonia and Latvia. to see the spread of these baltic tribes, follow this link on wikipedia. (4)Mindaugas or Mendoga was born around 1203. Very little is known about him. He becomes the first Grand Duke of Lithuania in 1236, and after a great victory against the Teutonic Order, he claimed the title of King of Lithania in 1251. He will be the only one to bear this title. To accede to the throne, he had had to accept his Christian baptism, in 1250 or 1251. He is murdered by members of his own family in 1263. (5) Alexander Iaroslavitch Nevski was born in 1220 and died in 1263. He became Prince of Novgorod in 1236 et Great Prince of Kiev in 1249. He achieves a great victory against the Swedish armies on the banks of the Neva River in July 1240 and crushes the army of the Teutonic Order at the Battle of Lake Peïpous in 1242. (6)Tartu (Dorpat) is est currently the second city of Estonia. In the beginning of the 13th century, it was the seat of a bishopric until the end of the 16th century. 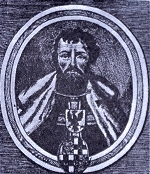 The first bishop was Hermann von Buxhöwden, the brother of Albert of Riga who was at the origin of the creation of the Livonian Brothers of the Sword . (7)Albert II of Saxony, born around 1250, Duke of Saxony in 1260, dead in 1298. (8)Albert II "the Degenerate" was born in 1240 et died in 1314. He was landgrave of Thuringe from 1265 to 1307, date of his abdication. (9)Otto (Othon) III "the Pious". He was born around 1215 and died in 1267. He is the second son of Albert II of Brandenburg and of Mathilda Wettin. He was Margrave of Brandenburg from 1220 to 1267. 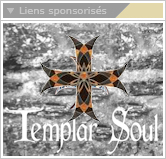 (10)Thierry(Dytryk ou encore Dietrich) "le sage", Margrave de Landsberg. Il est né vers 1242 et mort en 1285 de retour d'une expédition en Pologne. (11)This region, nowadays located on North-east of Poland (also called Borders or Marches in English) was occupied by several Old-Prussian and Baltic Tribes, among them the Pomeranians, Pomesanians, Warmians, Semigalians,... Follow this link on Wikipedia to have a glimpse of this tribes.